Happy New Year, Lean Girls! This week many are resolving to spend more time with family, save money, volunteer more, and no doubt lose weight. It’s no surprise, but the resolution to lose weight is the most failed resolution. Last year was the year I vowed to get down to 145 pounds and “take back my body.” I’ve always been a prisoner of the scale and worked against my body but today I feel free! 2011 was focused on my work outs and getting stronger in order to “take back my body” and working WITH it. Exercising is no longer about burning calories or losing weight but rather feeling strong. I love my body for all its imperfections and know that if I work hard and take care of it, it will love me back. I didn’t achieve my goal weight, but I’m not sweating it! Instead, I’m celebrating the fact that I reached my goal body fat percentage. I no longer beat myself up about the scale or what I eat. A year of training with Justin has made me stronger, leaner, and faster. I do in fact weight less and my body has a different shape. It’s a great feeling celebrating these things, rather than sulking about how I don’t weigh x amount. This year will be the year of nutrition. Just as I make exercising a priority, I will put in as much effort into what I put IN my body. I know my nutrition is what is keeping me from getting where I want to be. So for the next year, you’re going to see me blog a lot about my food and nutrition journey (in addition to the exercising). I’m actually going to have to eat out less and start cooking in my pathetic NYC kitchen. This is going to be quite the challenge! How have I resolved to focus on nutrition this year? 1. Coffee will not be purchased from Starbucks or any other grab-n-go coffee establishment for one year. All money that would’ve been spent on coffee will go into savings. (Getting my finances in order is another resolution this year). Oof. 2. Every Saturday or Sunday, I will prep food for the upcoming week. I will chop vegetables, make a big batch of brown rice, go grocery shopping, and try a new recipe. I will plan out my week’s meals ahead of time just like I planned my week’s workouts. 3. Eat whole foods and no “finished” foods that comes from a bag, box, container…. I want to fill my plate with foods that come from the ground or from nature. Nothing is off limits, but if I want a cookie I’ll have to make it myself. I already know these resolutions are going to be time consuming (and I won’t be perfect), but so what? I need to treat myself as a priority. And even if I’m 50% successful, it’s 50% closer to where I want to be. What Lean Girl resolutions did you set for yourself? How do you plan to achieve them? If you want to know about my other resolutions…. Learn enough French to be able to communicate when I travel. Run the NYC Marathon in under five hours. This morning, I didn’t have time take the time to make a breakfast so I picked up a blueberry muffin with my coffee. Starches and sugars galore! As I sat at my desk eating my muffin top, I realized that I was eating TOWARDS my muffin top. So without another thought, I tossed my barely eaten muffin in the trash. If you’re impulsive and drastic with change, your body will have no choice but to cooperate. What’s it going to do? Dig through the trash? 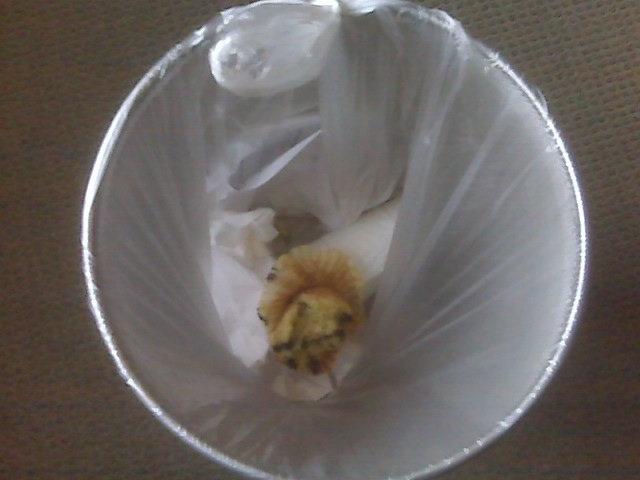 **This is my blueberry muffin in the trash can at the office.